This section is welcome news for patients who have put up with loose dentures. You don’t need to any more! 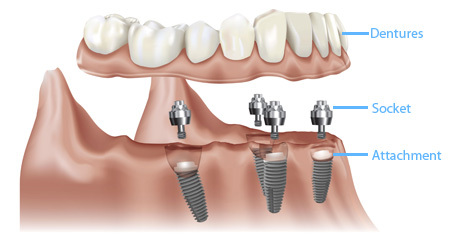 Implants can replace the teeth you have lost and be used as an anchor to hold your dentures in place. No more embarrassing moments in public, no need to sneak out to the washroom during a meal, no more choosing soft food instead of eating what you want, no more discomfort and sore spots on your gums. Dental Implants were first introduced 30 years ago and over time they have been refined to a point where now they are a standard procedure. It may sound dramatic to have a titanium implant screwed into your jawbone, but the truth is that it is not. It is simple and easy. What has made it easy and safe is that there are now special x-rays that use computer imaging to produce a 3D view of the jawbone. This allows an experienced dentist to see exactly what is happening beneath the gums and within the jaw. See the accompanying drawings that show an example of a lower jaw, where 4 implants have been placed in the jawbone, being careful to avoid any nerves or veins. The top of the implants poke out above the gum because there is a small ball on the implant end which clips into a corresponding socket on the bottom of the denture. The denture is now held in place just like you had your own tooth. The denture snaps into place in the morning and you take it out at night to give your gums a rest. The best part of this procedure is that you can wear your dentures straight away. At the end of the appointment you can leave smiling, with the dentures in your mouth. The implants will gradually fuse with jawbone and become stronger, but until then you should avoid eating hard or crunchy food. You will need regular appointments for about 4 months while the gums heal, as the dentures may need adjusting as they settle in.